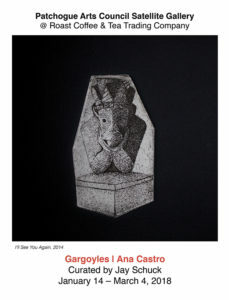 Gargoyles | Ana Castro | Patchogue Arts Council, Inc. The Patchogue Arts Council is proud to present Gargoyles, a solo exhibition featuring the artwork of Ana Castro. The exhibition is a series of gargoyle prints using multiple techniques including intaglio, woodcut, and linoleum. The exhibition is curated by Jay Schuck and is on view at Roast Coffee & Tea Trading Co. from January 14 to March 4, 2018 with a reception on Sunday, January 21, from 2:00 – 4:00 PM. The reception is free and open to the public. Ana Castro is a fine artist from Patchogue, NY. She received a BA in Studio Art and Art History from Stony Brook University in 2014. She is attending CUNY Queens College to receive her Masters in Art Education. She participated in Gallery North’s 2016 Summer ArtVentures program and offers open printmaking sessions and introductory printmaking courses for children at Gallery North’s Community Art Center. Her artwork has been exhibited at the Patchogue Arts Gallery, Gallery North, and Greenpoint Gallery.